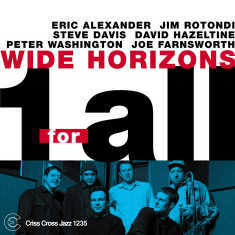 The all-star sextet returns for their fourth Criss Cross release. A frontline consisting of Eric Alexander's tenor sax, the trumpet and fluegelhorn of Jim Rotondi, and trombonist Steve Davis executes the band's arrangements of original compositions (plus two jazz standards) with �lan, as well as blowing spirited solos. Stimulating the horns, pianist David Hazeltine, bassist Peter Washington, and Joe Farnsworth on drums comprise a first-class rhythm section that completes the ensemble's unique sound.